An article about the evolution of the most classic and iconic diamond shape, the cushion shape. 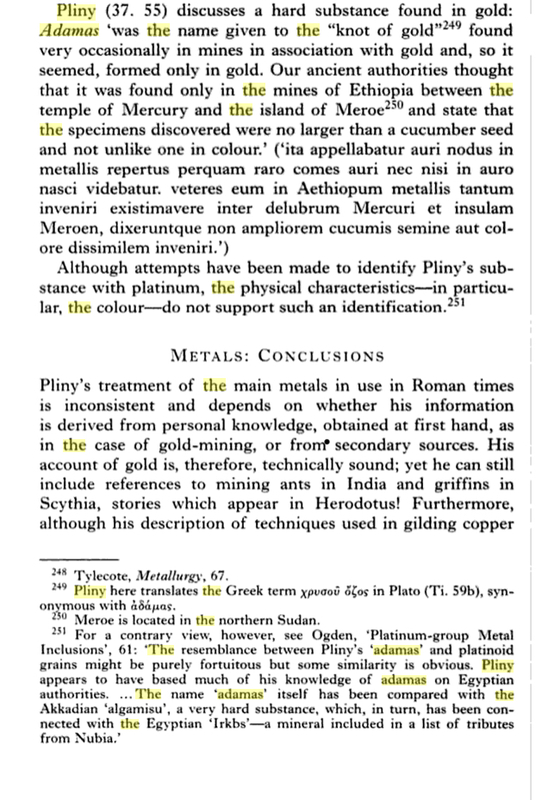 Diamonds where around at least since Pliny the Elder (23-79 AD) wrote in his “Naturalis Historia” (Natural History book XXXVII) which mentioned Adamas (diamonds). Diamond cleaving, probably was developed in India many centuries ago. The exact period of origin is unclear because cleaving methods & techniques were secretly guarded by families usually passing this ancient art from father to son. Whether BC or AD, cleaving was the only method available for shaping rough diamond for hundreds or perhaps thousands of years. Octahedrons are diamonds natural structure but not necessarily its natural form, most rough diamonds come in irregular shapes and forms. 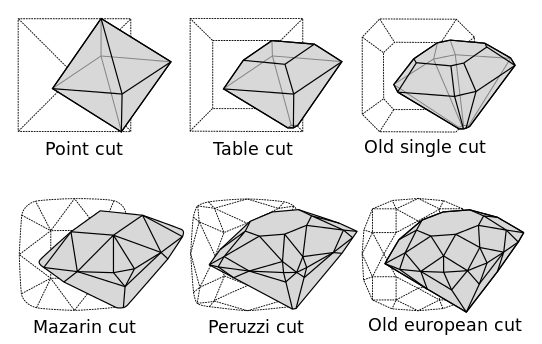 historically cleaving was mainly practiced in order to shape irregular rough diamond shapes into point cuts (see figure 2), the earliest known diamond cut. When diamonds first started reaching Europe around the late 13 – early 14th century, table cuts started appearing (see figure 2). Methods for facet-grinding started to develop allowing the faceting of the centuries-long point cuts and improving them to the then innovative table cuts. 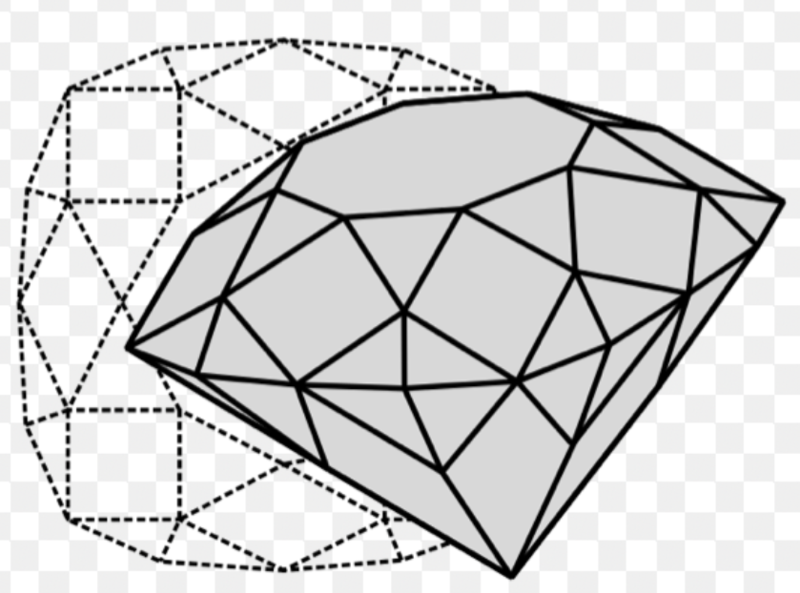 Natural diamond octahedrons are a three dimensional geometric shape/structure (two pyramids joined at their base), on rare occasions, octahedral shaped diamonds are found in near-perfect form (see figure 3). A nature’s wonders no doubt. Polishing a square table facet on one of the six points allowed a first internal view into a symmetrical (albeit natural) diamond shape revealing its internal play-of-light splendor. I can only imagine the curiosity explosion of cutters living in those times. Further evolution from table cuts leads to the two main faceting methods which we still mainly apply to our diamonds today, the step and brilliant faceting designs. In this article, we focus on the latter. As faceting methods further developed, a natural evolvement would be to take the table cuts which possessed only four crown and pavilion facets and further divide or fold them into eight crown and pavilion facets. 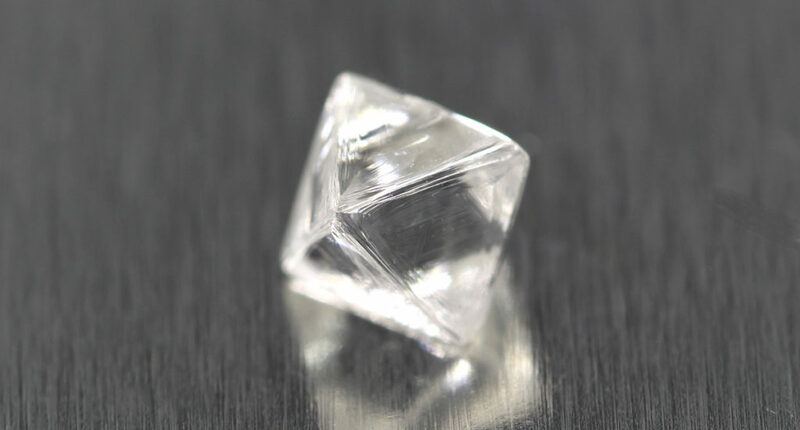 This octagonal’ish shape or old single cut allowed for more rapid flashing events being noticeable when in motion, diamond brilliance was discovered. The old single cut eventually evolved into double cuts or Mazarin Cuts (see figure 2) which some call the birth of the cushion shape. The square contour began to round-off slightly due to the splitting of the four crown and pavilion main facets in three triangular facets each. At about the same time the double cut was invented and credited to Cardinal Mazarin of France (17th century), a certain lapidary artist by the name Vincenzo Peruzzi was busy in Venice improving the double cut into what was considered at that period, the triple cut. Eventually, the triple cut came to be known as the Peruzzi Cut (see figure 2), the original faceting roots to the “standard 57-58 facet brilliant” which still reigns today almost four hundred years later. Vincenzo Peruzzi partially divided each of the eight main facets (both on the crown & pavilion) into sixteen triangular lower and upper girdle facets (halves) and adding eight triangular star facets conjoining the table facet with the crown facets. 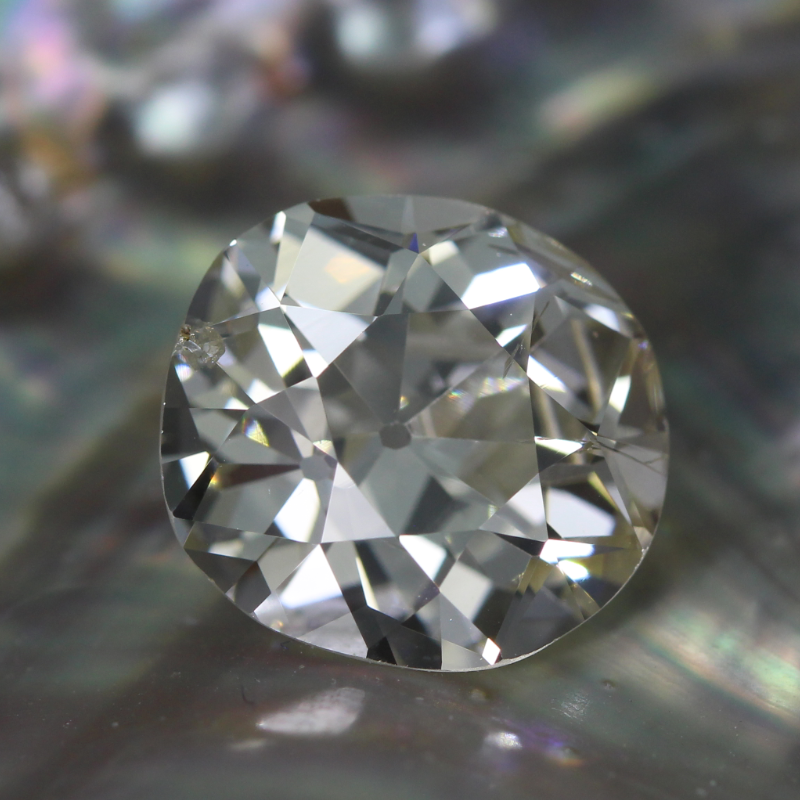 The brillianteering process was born, a sub-division of the old single cut 16 main facets into a geometric design made up of 58 facets including table and culet facets. Peruzzi’s design consisted of four wider main facets and four narrow corner facets which formed a square shape/outline with narrow rounded or sometimes pointy corners. As time evolved so did the faceting & shaping of diamonds. Eventually, cutters would divide the eight main facets closer in size by enlarging the corner facets. This would create an overall more symmetrical shape instead of the four wide and narrow division mentioned above. Such diamonds were cut with no planned girdles, the connecting junctions between crown and pavilion facets developed sharp knife-edges which divided the crown and pavilions sections and were the determining factors for the shape/contour of the diamond. More knife-edge breaks gave an optical sense of roundness when looking at the face-up position, square cuts started to appear slightly curved, and cushion shapes were born (albeit cushion shapes made of sixteen straight knife-edge sections (see figure 3). With years of handling and wearing jewels set with such diamonds, their natural patina was a major contribution to the shaping of such diamonds. Time, wear and tear would further soften the knife-edges into a more rounded cushiony feel and look. Presently, the majority of genuine old mine cut diamonds survived exhibit centuries old patina which with no doubt contributed their share to the curvy old mine cut diamond shapes we today identify as the cushion shape. Antique old mine cut diamonds allow us the luxury to possess and enjoy diamonds that were literally shaped by history. When modern round brilliants appeared in the later part of the 19th century, the early wonky brilliants started being identified as Old Mine Cuts or “Alt Schleif” in German or Yiddish, the sectorial dialect of that period.